“Command can rely on the fact that, when things get difficult, Oyama will remain cool and calm, and that, when the smoke clears, he’ll have fulfilled his duty. And that is the best one can say about a dirty Japanese.” Captain Song Lau. Excerpt from the evaluation report of Takeshi Oyama, on the occasion of his promotion to Non-commissioned officer of the Domaru Butai. The Domaru Takeshi “Neko” Oyama is a samurai warrior of the old school, upright and honorable, a paragon of the perfect Bushi. His face, lean and serious, always displays a resolute and sober expression. He has a curt and taciturn manner and his behavior in all areas of life is guided by the creed of the Bushido code. He wears his scars with pride, as a mark of virility, but as a good Bushi, he never brags about them. Because of this, people initially thought Oyama was a very fortunate individual. His nickname “Neko” (?, “cat” in Japanese) is due to his ability to fall always on his feet and the great number of lives he seems to have. But a he doesn’t just rely on luck. 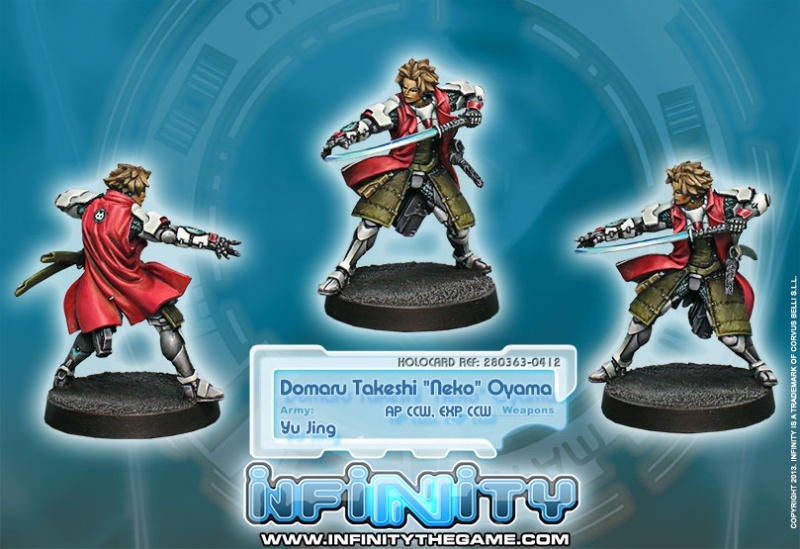 Oyama is a veteran warrior who has survived many battles simply by being the best. Coming from a high class Nipponese family of Bushi origin, his life was always focused towards his training as a warrior. He has trained in the dojos of the most prestigious masters, where he highlighted his talent as a superior duelist. He joined the army, driven by a strong personal sense of honor and not an eagerness for social prestige. His first detachment was a Butai (Regiment) assigned to Svalarheima. There began his legend. He was part of an advanced post garrison that suffered an intense PanOceanian attack. The enemy troops outnumbered the defenders four to one. The defense was unsustainable. When the reinforcements arrived, there were only two people alive: the garrison’s medical officer and Oyama, severely injured but defending the post single-handedly. Once finished convalescing, he was transferred to Paradiso with the rank of Non-commissioned officer. On a long range patrol mission, his unit found a Shasvastii scouting party. After a savage close quarters combat, only Oyama, wounded and exhausted, was able to return and report. Yu Jing troops reinforced that area and Shasvastii infiltration behind human lines was prevented. 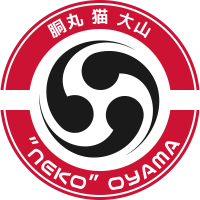 Oyama, already nicknamed as “Neko”, also served in the Ariadnan Commercial Conflicts, where he honored his nickname again, surviving the impossible. 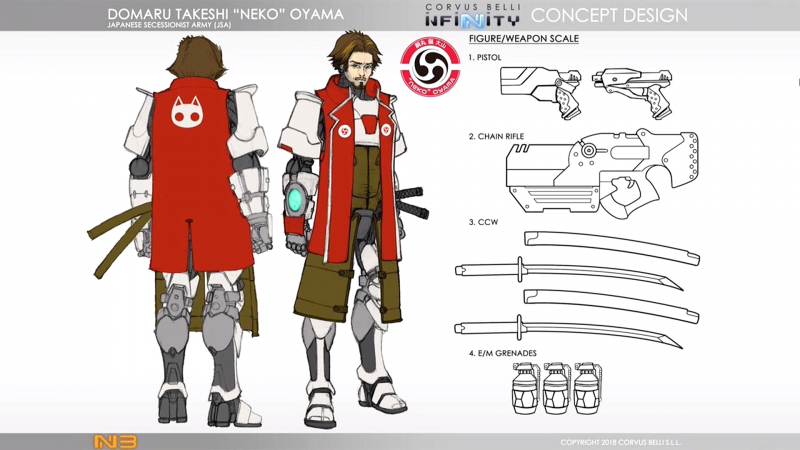 Takeshi “Neko” Oyama knows the path of the samurai resides in death. He knows the dangers he has in front of him and fearlessly awaits the sun setting on his life, getting closer with each step to his final end. He has no fear of dying; to him it is perfectly acceptable that the path of the warrior requires life as its price. This page was last modified on 10 June 2018, at 04:44.